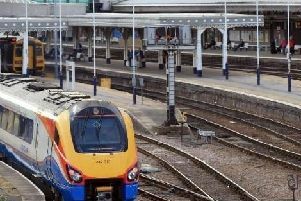 A Doncaster councillor is urging residents to make their views known on high speed rail while they still have the chance. The proposed HS2 route, announced in July, if it gets the go-ahead would go from Bramley, through The Shimmer Estate in Mexborough, before heading out to Barnburgh, Hickleton, Hooton Pagnall, Clayton, Frickley and Crofton in Wakefield. Residents can put their views forward on what they think to HS2’s proposed plans to take the route through the villages, including the options of putting a parkway station at Hickleton, Clayton, or Mexborough. Coun Cynthia Ransome, who represents the villages, said: “We’ve fought this proposed route since it was announced last summer and we need to keep fighting it, especially now with HS2 proposing that Hickleton and Clayton could potentially be home to parkway stations. “It’s not only the stations that would impact on the villages but also the increased traffic. Now the consultation has started residents need to let HS2 know how they feel about the proposals. Protesters have taken petitions and letters to Doncaster MP Ed Miliband, who handed them to transportsecretary Chris Grayling. They are working with other areas affected by the proposed route, and have also been to Downing Street to deliver petitions and objection letters directly to Number 10. Villagers can have their say by logging onto https://property2b.dialoguebydesign.net/, by emailing a response to route2b@dialoguebydesign.co.uk, or by writing to FREEPOST HS2 phase 2B route refinement consultation. Additionally there is a printed form to complete, available from the Harlington shop, the Chemist in Barnburgh, The Harlington Inn or The Crown, Barnburgh, where they can also be handed in. Deadline to do this is no later than March 1 – to allow time for posting.